– Kristen, reviewed on WeddingWire.com. At One Fine Day Photographers & Videographers, we understand how important, special and unique your wedding day is. That is why our team of experts makes sure to capture every detail, laugh, and magical moment as your friends, family and loved ones come together to celebrate your special day. One Fine Day Photographers & Videographers is a premier and trusted photography and videography service provider specializing in weddings and special events in Long Island and Tri-State area. Our award-winning team of photographers and videographers assembled by Howard Fritz is highly experienced and equipped to provide you with timeless and flawless imagery for you, your friends, and family to cherish for generations. Why Choose Fine Day Photographers & Videographers? Since inception, One Fine Day Photographers & Videographers has served many satisfied couples and clients in Long Island and surrounding areas. We believe that recording your life’s most precious moments should be handled by highly experienced and dedicated photographers and videographers. That is why we make sure to provide you with only the best team of award winning and elite photography and videography experts that has years of collective experience and equipped with top of the line equipment. Having years of experience and utilizing innovative lens and lighting techniques make it possible for our experts to capture your fondest moments with grace and precision. At One Fine Day Photographers & Videographers, recording your Long Island wedding or special event is more than just a job. We are passionate about the art of photography and videography, in addition to being skilled in a number of styles stemming from portraits to candid photographs. Our team is proficient in capturing your special moments in the most relaxing, affordable and complementary manner. One Fine Day Photographers & Videographers takes great pride to be awarded a Five Star rating on WeddingWire.com, the premier online wedding website, and also claimed Wedding Wire’s Couple’s Choice Award. Our company was also awarded Best of the Knot 2015 and 2015 Best of Long Island Weddings. In addition to being credited for fine craftsmanship and excellence in photography, One Fine Day’s founder Howard Fritz is active in the Professional Photographers of America, Professional Photographers of Greater New York, Professional Photographers Society of New York State, and the Professional Photographers Association of New Jersey. One Fine Day Photographers & Videographers is available for any significant event in Long Island and areas, including Bar Mitzvahs, Bat Mitzvahs, confirmations, sweet 16 parties, corporate parties, celebrations, celebrity and media events, and fundraising events for your organization. No event is too large or too small for us to embrace. Our goal is simple: to provide a beautiful product that will stand the test of time. A marriage is a milestone in a person’s life and wedding photography and videography are the mediums to provide you with an album and a recording of unforgettable memories of that special day to cherish forever. Ever since the camera was first invented, photography became the best medium for capturing memories. However, due to technological advancements in the field, the original photography that relied on film has for the most part been replaced by digital photography. Using this latest technology, One Fine Day Photographers & Videographers can provide you with a wedding album that will perfectly reflect your wedding day. New York has long been known for various wedding styles – from the traditional to the unconventional, from the quirky to the theme-based. New York also has the best venues – from its white, sandy beaches to the best hotels and resorts in the region. However, no matter which style of wedding or venue you ultimately choose, photography and videography should play no less of a role in your wedding plans. As you allow yourself the time to find the wedding dress of your dreams, so should you allow the time to search for a photographer and videographer with the skills to provide you with memorable pictures to mark your special day. In addition, a modern trend in wedding venues today is the destination wedding. Long Island Wedding Photographers and Videographers are well skilled in the art of destination wedding photography and video to capture all the romantic moments of the bride and groom in pictures that will reflect the grand style of the couple’s wedding day. Although the actual memories of the day – walking down the aisle, the vows and exchange of rings, the cake cutting, flowers and decorations — may fade from memory, they will come to life again by viewing the images and recordings preserved in these photographs and video footages. Long Island Videographers are also skilled in providing you with exceptional pre-wedding photography and engagement shoots. By consulting with clients and learning about their expectations, and with expert knowledge and experience of ideal locations in the Long Island area, One Fine Day Photographers & Videographers will provide you with beautiful pictures in enticing locations to mark the beginning of the journey that culminates in your perfect wedding day in Long Island and surrounding areas. Contact One Fine Day Photographers & Videographers Today! Contact One Fine Day Photographers & Videographers today and experience the most comprehensive wedding and special event photography and videography services in Long Island and surrounding areas. With our experience, passion, love and care, your wedding and special occasion will be memorialized forever! (516) 690-1320, or using our quick contact form. Our goal is to effectively capture your special moments, so that you’ll end up with wonderful wedding photographs to enjoy for a lifetime. Visit our galleries to see what we’ve done for other happy couples in Long Island, the Tri-State area, and beyond. You can relive the most joyful day of your lives year after year through our beautiful video of your wedding. Spend a few moments in our wedding theater to get a glimpse into the special memories of our other wonderful couples from Long Island and the Tri-State area. When you trust your wedding day to us, you’re not only getting the combined experience of hundreds of other weddings, but you’re also getting a team who will take the time to really understand YOU. 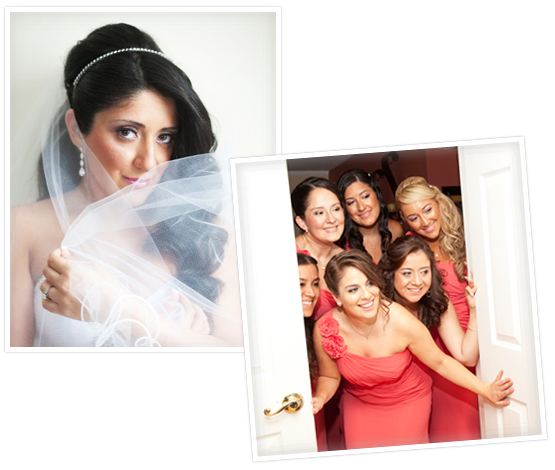 We specialize in wedding photography and videography in Long Island, the Tri-State area, and beyond. – Kim, reviewed on WeddingWire.com.